Recently signed to Strictly Rhythm, and with tastemakers such as MistaJam already showing support, Fleur is working with a host of producers, including DaVinci, White N3rd and Tim Powell (who has produced for Girls Aloud and Kylie Minogue). 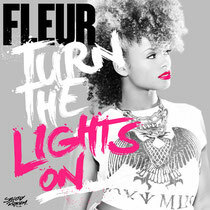 ‘Turn The Lights On’ is Fleur’s follow up to her Cutline collaboration ‘Broken Mirror’. Produced and co-written by London-based drum & bass producer James Pountney aka Culture Shock, the track mixes Culture Shock’s textured and melodic high octane beats with Fleur’s effervescent vocals and thoughtfully penned lyrics. Fleur: “The track is a definite party tune, it’s about being on that high, never wanting it to end and just wanting everyone else to join in with you! Just enjoy it, enjoy the music! I want to get my music heard all over the world. That’s the big aim.” ‘Turn The Lights On’ received its first exclusive play on Friction’s Radio 1 show and will be released on Strictly Rhythm Records on February 17 with remixes from Prototypes and Patrick Hagenaar.